The triple-wide mansion that’s the annual setting of Manhattan’s Holiday House has largely been spared the cut-and-paste architecture that a house passing through multiple owners, years and hands tends to suffer. This storied mansion still has its share of ample spaces, with plenty of room and plenty of character before the first Oushak is unrolled. But there is still a scattering of odd rooms, tucked under stairs or off entry ways, that threw designers a curve, odd angle, and vaguely defined function. Often, they’re not even rooms at all. They’re corridors, landings, stairwells, and the design equivalent of Top Chef’s Quick Fire challenge. And often, they're just as revealing of a designer’s problem-solving and space management skills. Even with such tough starting points, the solutions, when they work, exhibit great style, prowess and, to this small-space resident and design practitioner, big inspiration. Without fail, the rooms that hold my attention are these small ones. Like last year, these small and odd spaces are often my very favorite moments in the house. 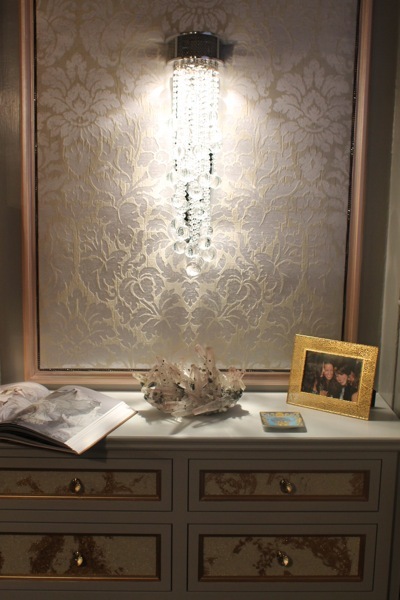 Taking the style-factor soprano-high is the gorgeous and clever use of the Maya Romanoff Bedazzled Leaf beaded crystal wall-covering, here applied to drawer fronts and (under glass) tabletops of the practical wall of built-ins. 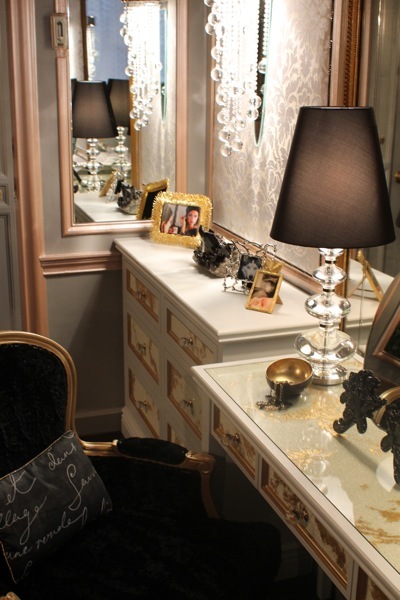 From the pair of Jonathan Adler lamps (like back-up genies at the ready) to mirrored walls and dramatic lighting, this room is all sparkle and shine. 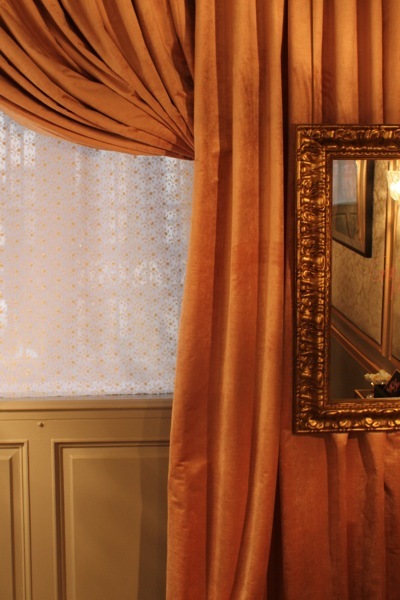 A brocade fabric cloaks the walls, and the whole room is framed with gilt, dotted with crystal (in both natural and cut-and-polished form), and underscored with mascara-black accents. A sweep of skin-tone flattering coral fabric (from Hyland, whose head, Christopher Hyland, is this year’s Holiday House co-chair) helps set the stage for this dramatic little endeavor. The music of the night, indeed. Upstairs, interior designer Jon Call of Mr. Call Designs and Robyn Pocker, of the venerable New York framing house J. Pocker & Son, used the tricks of both their trades to give Versailles shine to an upper floor stairwell. 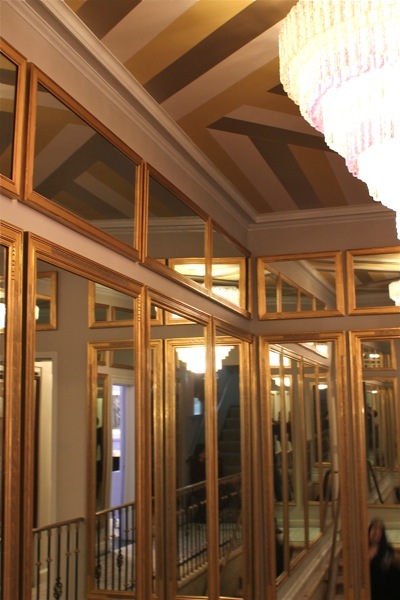 Jon combined stock mirrors and custom framed versions, creating a trumeau-effect and instant architectural presence. 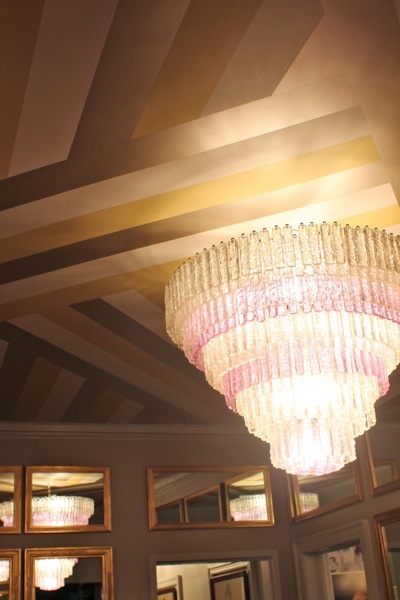 A striped wallpaper was cut apart and reapplied with panache, like Art Deco lightning bolts or the Chrysler building’s rays. It’s a dazzling display of what can be done to elevate an economical purchase with a little out-of-the-box thinking (and a patient paperhanger). Floating against that patterned ceiling, a stunning tiered crystal fixture that shares the paper’s banding, the mirrors’ sparkle, and even a touch of lavender from the nearby Sweet Sixteen confection of Robyn Karp Design. All together, it brings a little Radio City Music Hall to a space that not many would even consider decorating. It also exhibits perfectly Jon’s take on design: some prêt a porter, some haute couture, some investment, some savings, and a lot of style weaving it all together. My only regret about this space? That my portraits of the dashing Mr. Call himself did not at all do him justice. Things may be bigger in Texas, but Dallas designer Janet Rice seems to make her mark in just a few feet of space. In a multiple-arched but hardly ample hallway (leading to Charlotte Moss’s grand cube of a bedroom) Janet used a trailing and lyrical Gracie hand-painted paper (in a yet another paperhanger’s tour-de-force). Pewter, dove gray, platinum, crystal and quartz bounce limited light and up the elegance, while custom shallow demilunes give the space actual function. 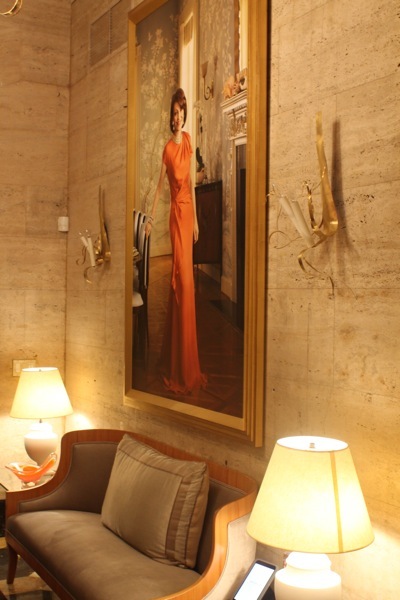 In a note of show house chance, serendipity, and karma, the paper Janet chose is the same paper in the bedroom of Evelyn Lauder, pictured in Evelyn’s portrait downstairs. The overhead fixture (an arching Venetian glass lantern, not shown) seems too good to not have been part of the original house, but it’s one of Janet’s limited, but super-smart additions. My favorite element (also not shown) is a high-tech gem of a freestanding light fixture, bringing contemporary spin to this otherwise traditional take, like a dazzling Elsa Perreti pin on a vintage gown. I have a soft spot for this, well, spot. Last year, Dineen Architecture + Design turned this pass-though nook into destination with equal aplomb. 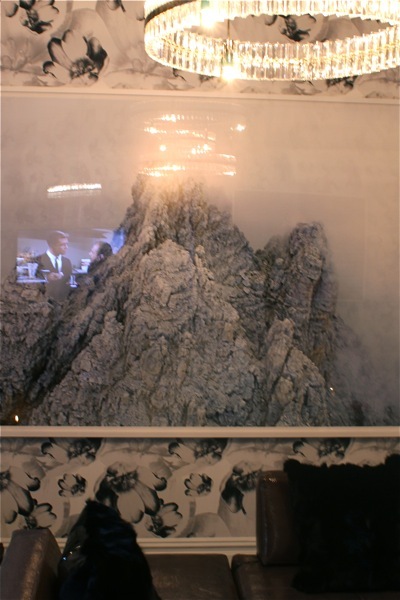 There are at least fifty shades of gray in the wallpaper of her own design in the room of Brett Beldock, and that’s exactly the tone being set in her kitten-with-a-whip take on Valentine’s Day. Sure, there’s romance in that all-over modern floral, (the effect is a New Age, amped up grisaille), chocolate-evocative daybed, and a table set for two, bon-bons at the ready. But while the table is set for dining, the room is set for, well, dessert. What sets the nicely naughty tone? Mostly, contemporary (and lush-lipped) photography by Alex Prager, evocative of movie stills and rife with seductive tension. The biggest of the smalls among this little roundup, Brett's room was still a challenge with an odd footprint, low ceilings and just one window, but all no match or worry for the seasoned interior and wallcovering designer. She incorporates two of my favorite space-stretching tricks to overcome. First, a dining area hiding in plain sight, with Niedermaier’s Saarinen spin-off table, scaled down then raised to perfect sofa-dining (or laptop surfing) height, that would stretch function for miles in a studio apartment. The other, a large photographic landscape which makes another window where there is only one, in this odd little el of a room. Brett’s paper backdrop is the modern floral to Tobi Fairley’s black and white contemporary grasscloth trellis just steps away, proving that timeless black and white is not going anywhere, ever, if only for its ability to provide the perfect foil for whatever’s in front of it. Alla Akimova, of Archive ID, made celebration, ceremony and art of a stairwell, a light well and what basically amounts to an elevator lobby. That’s the modern alchemy of Archives ID, and Alla has bridged two trends shown elsewhere in the House: Art installation and classic show house storytelling, to make a mark in two of the home’s toughest spaces. 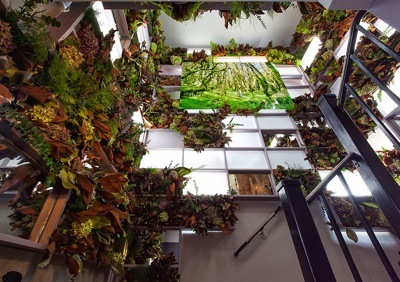 Up the stairwell, a botanical and contemporary lightbox installation, to bring light and life to a back stair, and honoring Arbor Day. Even an awkward lightwell providing roof access has been turned to something noteworthy, with a sound installation and flickering candles. 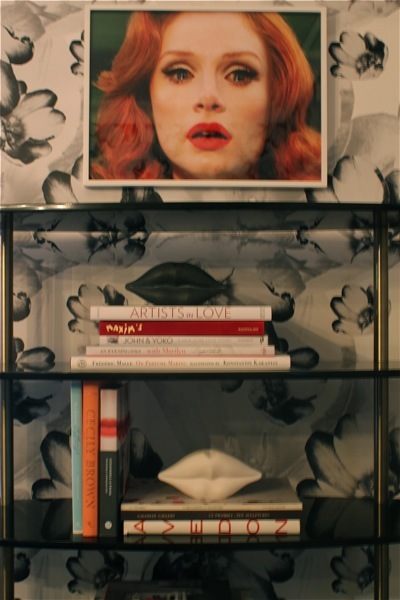 Up the steps and around the corner, great tricks and perfect choices make the most of a windowless throwaway space. 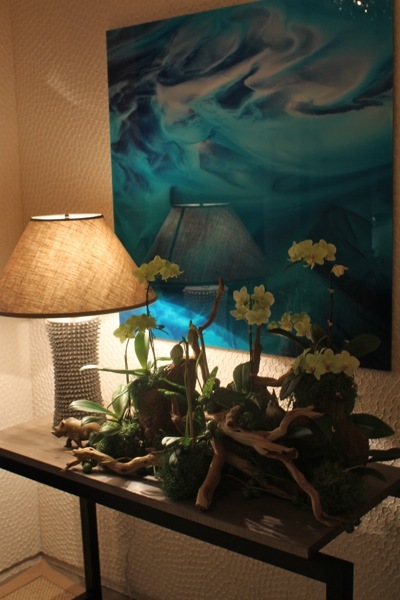 The stunning Maya Romanoff Meditations Ohm paper and overhead Arctic Pear Double Wave fixture from Ochre (at once, both ocean wave and water drops) prove that the exhausted décor term of “Zen” can still have great life deep-breathed back into it. 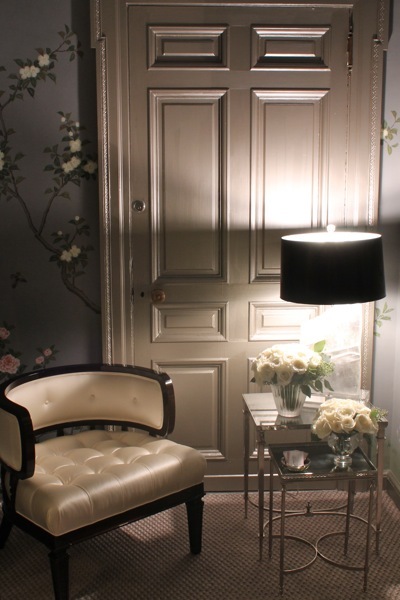 Uplighting and lush, creamy textiles create a window where there is none, and creates dreamy, diffused and flattering light in the process. A square of watery turquoise, on loan from LUMAS, is the monochromatic room's sole color jolt, above a Niedermaier console. 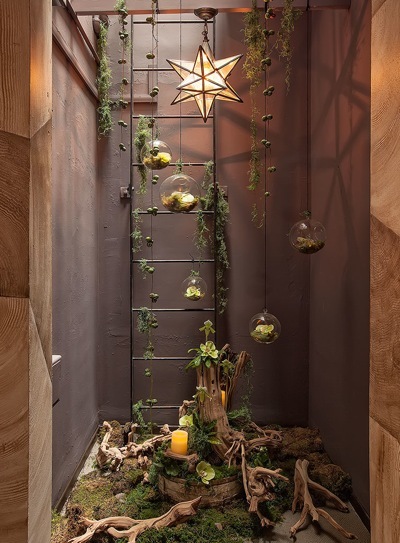 Details extend the Arbor Day theme, but the narrative changes, and this room celebrates Columbus Day, with New World watery, natural and nautical references that stayed “inspired by,” and not “slave to” the holiday at hand. The built-in banquette of Alla's design is ship-shape and super smart: the inward orientation of the shelves keeps things practically right at hand, but keeps the visual of the room calm. 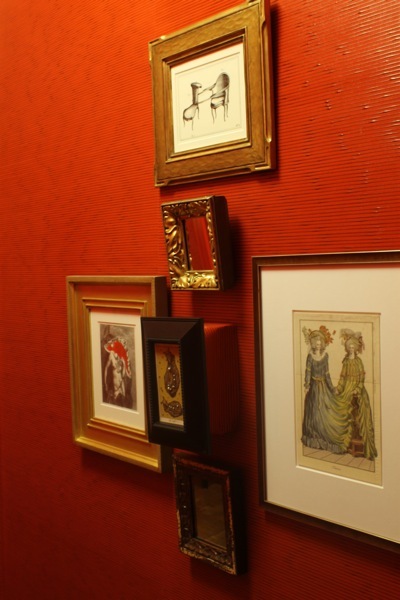 Speaking (again) of Maya Romanoff, Roger Thomas' design of red-hot hallway (shown, very top) was due to yet another generous donation from these exquisite paper and surface crafters. The hand-painted Tremolo hand-painted lipstick-red wall covering brought life, and opium den-meets-Grauman’s Chinese theater intrigue and Hollywood Deco glamour to another tiny hall that could have otherwise been lost to the shadows. Design is, in large part, problem solving. Even in the smallest of spaces. 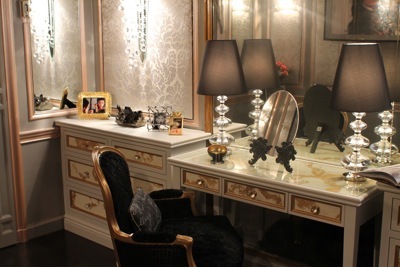 Sometimes, as shown in this year’s Holiday House, especially in the smallest of spaces. What details did you most love from among the house’s more diminutive spaces? Get Social! Find Holiday House, Mr. Call Designs, Janet Rice Interiors, Maya Romanoff, Archives ID, Ochre and Niedermaier on Facebook. PREVIOUS: Read Part 1 and Part 2. All photos, Patrick J. Hamilton unless noted. 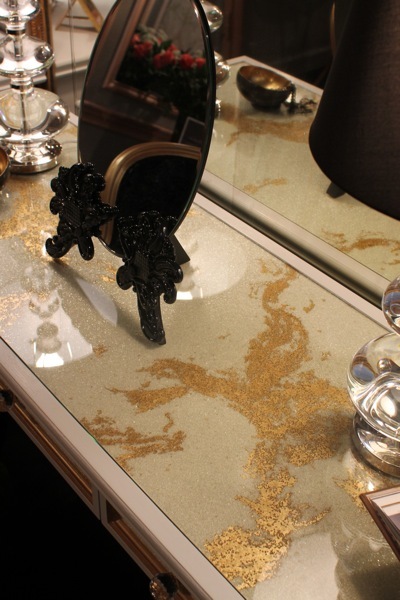 Patrick I love seeing how designers create and turn these small spaces into jewels of delight. 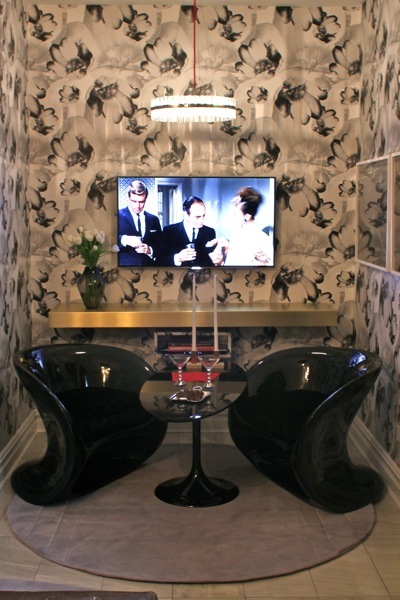 Bravo and thank you for sharing these fab tiny rooms!